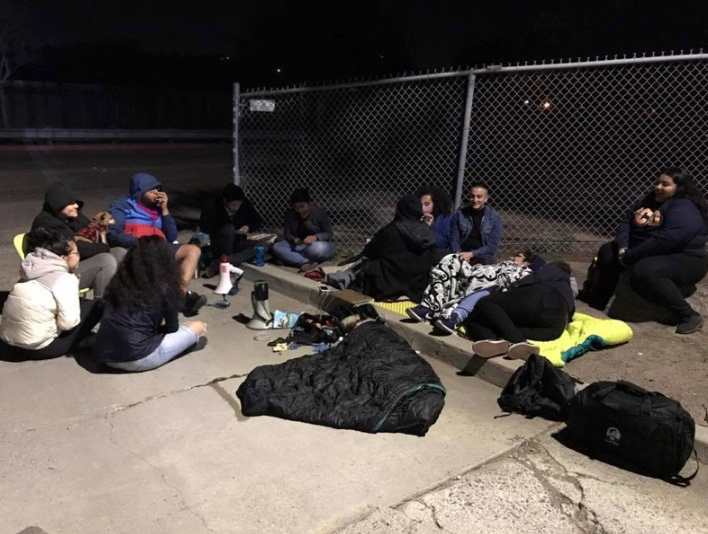 Activists with the Immigrant Youth Coalition camp out in protest in San Diego Thursday night to demand the release of fellow immigrant rights activist Claudia Rueda. Rueda and her mother were arrested and detained for deportation although they do not face criminal charges. Recent arrests of a Los Angeles mother and daughter who now face deportation are shining a spotlight on a shift in immigration enforcement driving a spike in non-criminal detentions. Immigration enforcement officials have long prioritized immigrants with criminal records for arrest, but under the Trump administration, people connected to those targeted have also been caught in the net. The case of Boyle Heights residents Teresa Vidal-Jaime and her daughter, Claudia Rueda, illustrates the issue. Late last month, U.S. Border Patrol agents arrested and detained Vidal-Jaime after authorities conducted a drug raid at her apartment complex. Her husband, along with others, were arrested on drug charges. Vidal-Jaime was not charged with a crime, but she was detained for living in the country illegally. She became what immigration officials call a collateral arrest — someone detained for deportation who is not targeted but who agents encounter by circumstance. On Thursday, Rueda, Vidal-Jaime's 22-year-old daughter, was also arrested. Border patrol officials said she and several others were picked up in connection with last month's drug bust arrests. They said Rueda doesn’t face criminal charges either, but they plan to deport her as well. She, too, lacks permission to reside in the U.S.
Rueda's arrest has riled immigrant rights activists, who say she was targeted because she is an immigrant advocate and helped secure her mother's release on bond. Officials would not say exactly why Rueda was picked up. A statement from border patrol officials Friday said the arrests of Rueda and others "were the result of targeted enforcement actions" that grew out of the drug bust investigation. The women's cases point to a trend since President Trump took office: collateral arrests of immigrants have risen along with arrests of those who don't have criminal records. Monika Langarica, a San Diego attorney representing the women, said neither of her clients fit the profile of immigrants deemed priorities for arrest under either the Trump or Obama administrations. “Neither Claudia nor her mom have prior criminal convictions," Langarica said. "The thing that we are seeing happen with this administration, and what we have seen over time, is this constant redefining of what it means to be a criminal." She said Rueda's only offense has been a civil-disobedience arrest at a rally, which did not lead to a conviction. A border patrol spokesman said Rueda overstayed a visa, which is not a criminal violation. Langarica said Rueda arrived in the U.S. as a minor and has been hoping to qualify for Deferred Action for Childhood Arrivals, a program that grants temporary protection and work permits to young unauthorized immigrants who arrived as children. This week, U.S. Immigration and Customs Enforcement officials announced that arrests had jumped by 38 percent nationwide since the president took office and signed an executive order that eliminated protections of unauthorized immigrants put in place in the later years of the Obama administration. During Trump's first 100 days, non-criminal arrests more than doubled: there were more than 10,800 arrests in that time span this year compared with about 4,200 during the same period in 2016. Immigration officials said in a statement that Homeland Security Secretary John F. Kelly has made it clear that "ICE will no longer exempt any class of individuals from removal proceedings if they are found to be in the country illegally." Steven Camarota with the Center for Immigration Studies, a Washington, D.C.-based think tank that supports immigration restrictions, said the rise in collateral and non-criminal arrests marks a return to the policy in place before the Obama administration shifted its focus to arrests of those with criminal records. "When they came across other, more run-of-the-mill illegal immigrants, they would not arrest them," Camarota said. "However, that was a break with the past." Attorney Langarica said there's no benefit to pursuing and deporting those who are not criminal offenders. "It is unnecessary," she said. "It is a complete waste of public resources; it is despicable, and it's an attack on immigrant communities." Camarota said while he has calculated that it can cost roughly $15,000 to detain and deport someone, there is benefit in arresting anyone in the country illegally. "It preserves the rule of law, it protects the sovereignty of the United States, it is good for taxpayers, it is good for workers at the bottom end of the labor market,” he said. Rueda and Vidal-Jaime are both fighting to stay in the U.S.